In the early morning hours it began circulating as a rumor on German Supernatural discussion forums. By Mid afternoon it was confirmed as fact by a posting Supernatural actor Jim Beaver made on his Myspace Page. “Supernatural” executive producer & director Kim Manners passed away last night in Los Angeles, following a battle with cancer. “Everyone at ‘Supernatural’ is walking around in a daze, shocked and absolutely devastated. Kim was a brilliant director; more than that, he was a mentor and friend. He was one of the patriarchs of the family, and we miss him desperately. He gave so much to ‘Supernatural,’ and everything we do on the show, now and forever, is in memory of him. The soft spoken Kim Manners had been with Supernatural since the first season coming in as director of the season one’s 4th episode, “Dead in the Water”. Even though Manners went on to become an executive producer of the hit series, which stars Jared Padalecki and Jensen Ackles as demon fighting, monster hunting brothers Sam and Dean Winchester, he continued to direct up until his illness hospitalized him in December of 2008. His last listed episodes as director is the season 4 episodes “Lazarus Rising” and his final one, “Metamorphosis”. Kim Manners, who is the son of Cleveland Ohio born director/producer Sam Manners, was no stranger to the entertainment industry having been raised into it by being the son of such a well known and well respected industry professional. Manners, whose career began back in 1970 has spent over three decades in the entertainment industry working as an actor, producer and director and has worked on such highly successful projects as The X-Files, Baywatch and 21 Jump Street which starred a young and up and coming Johnny Depp. Yet it was more than just three decades of entertainment industry experience that Kim Manners brought to Supernatural as a director and executive producer, by all accountings from cast and crew alike, Manners brought a sense of solid strength and good-nature to everyone involved with the series and to the set. Both series leads Jared Padalecki and Jensen Ackles love to relate their favorite story about how Manners playfully ‘got them back’ for the numerous pranks they played on him by waiting until both actors were trapped in a small tunnel like set in the season 2 episode ‘No Exit’ and poured a large bucket of cold water down on them. Kim Manners could also be relied on by the cast and crew to be a practical problem solver as Jensen Ackles points out in a recent interview with the Official Supernatural Magazine. In the interview, Ackles relates how Manners took charge of figuring out how to get the actor, who was stranded at the LAX airport over the tail end of busy holiday because his seat was sold out from under him on an over booked flight, to the set of Supernatural in time to meet his set call and not lose the production money and time. 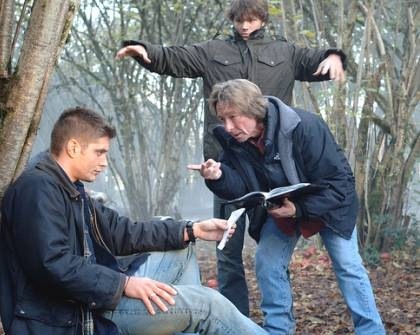 Kim Manners cared about Supernatural, it’s cast and crew. He took pride in his work and in being part of bringing the fans and viewers the best possible stories being told. It’s a given that all of those involved with the production of Supernatural are going to miss their co-work, friend and director/executive producer. Those of us out here in the fandom and media are going to miss Kim Manners as well. We at EclipseMagazine.com send our prayers and condolences to the Manner’s family and to his ‘Supernatural family’ as well. Kim Manners will be missed. This is such a great loss. For his family and friends the most but also for fans of Supernatural, he truly brought out the best in the show. So many of his episodes are the classics. It’s always a tragedy when we (America) loses someone so instrumental in what they do, especially when they are still working hard and making things happen. My heart goes out to his family and I will miss his fantastic episodes. How sad, I recently started watching Supernatural and it is such a fresh change from all of the other shows on the CW. What a tragic loss.